Previously, we have talked about tiny off-grid houses and small yet ridiculously priced houses. 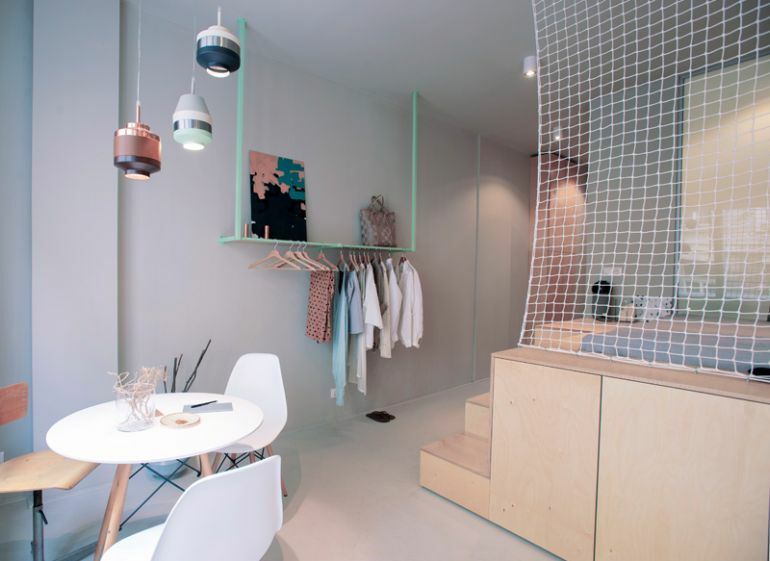 But the new AirBn’P apartment pictured above (designed by POSITION Collective) apparently sheds away the gimmicks in favor of practicality – all inside a minuscule 30 sq m (323 sq ft) of area. 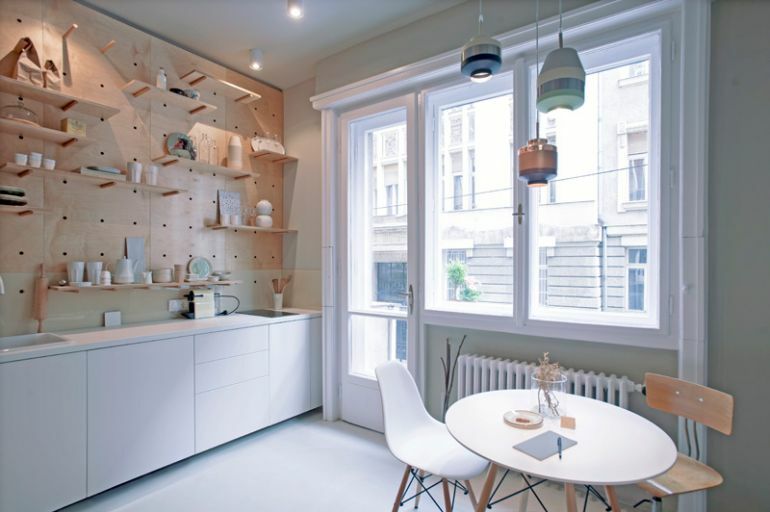 Situated in Budapest, the architectural ambit of the habitat obviously alludes to precise design considerations. This not only translates to spatial efficiency, but also covers better storage, easy accessibility and even pertinent color combinations. The latter part relates to one of the older tricks of architecture where lighter color schemes and paints are used to endow a sense of spaciousness within a volume (aided by enhanced reflection of sunlight). This is complemented by pale-hued fixtures and furnishings. And within the volumetric scope, the AirBn’P apartment comprises two specific zones, with the bigger zone consisting of the collective ‘living space’. This entails a bedroom, kitchen and lounge area combined into one. 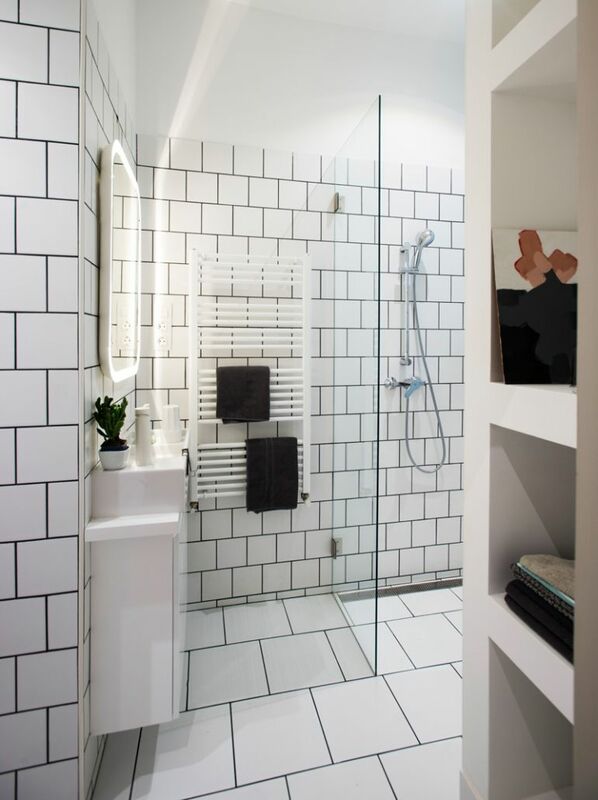 As for the smaller zone, it encompasses a separate bathroom with an opaque window for induction of small amounts of outdoor air and light. 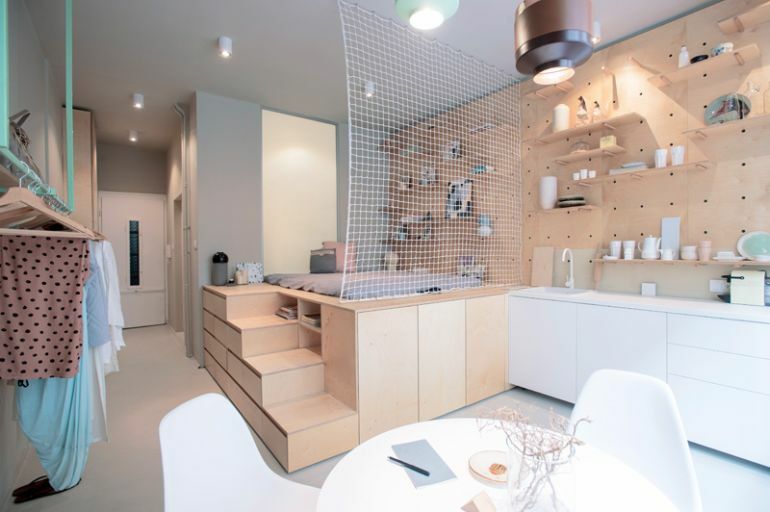 Interestingly enough, the AirBn’P apartment plays with our perception of a partition, and how opaque walls might just be redundant in some user spaces. 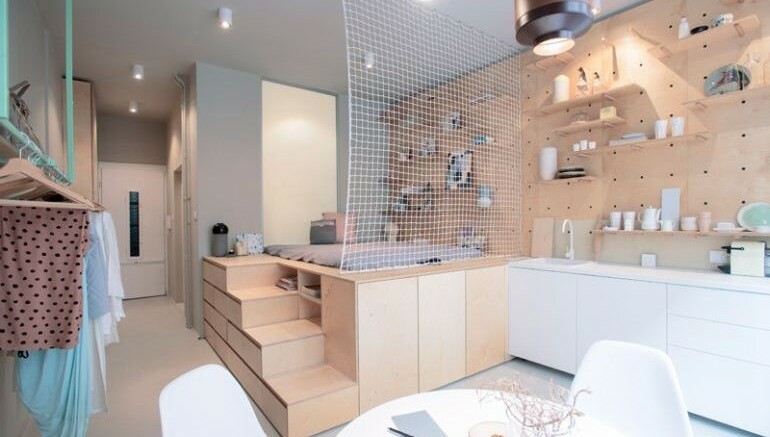 For example, in this case, the bantam kitchen part is segregated from the tiny bedroom space by just a transparent net (which saves some precious area). Obviously, the same level of transparency wouldn’t work in a bathroom section, given the user’s need for privacy. However the ‘piece de resistance’ of the AirBn’P apartment arguably entails the scope of storage and its accessibility. 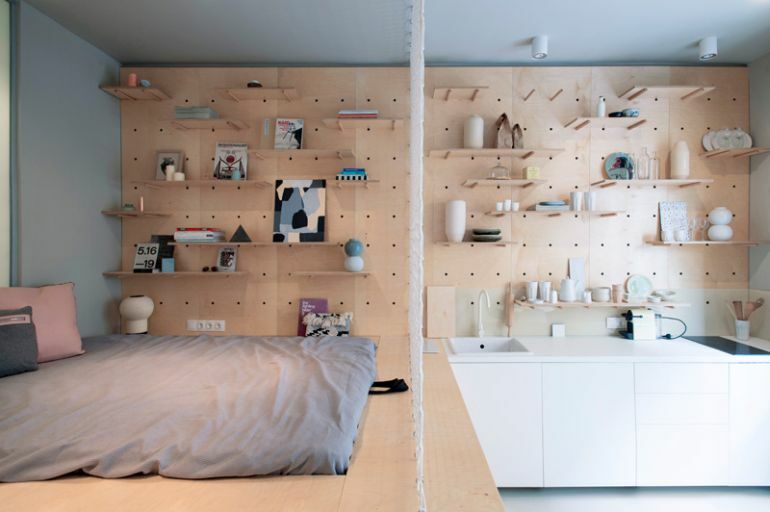 To that end, the bed component made of plywood, exhibits a range of storage spaces beneath its structure. These range from cubbyholes, cupboards to drawers that double as steps leading up to the bed. Such space-saving storage units are complemented by the main wall facade of the habitat – with its arrangement of holes that can accommodate various types of shelves. 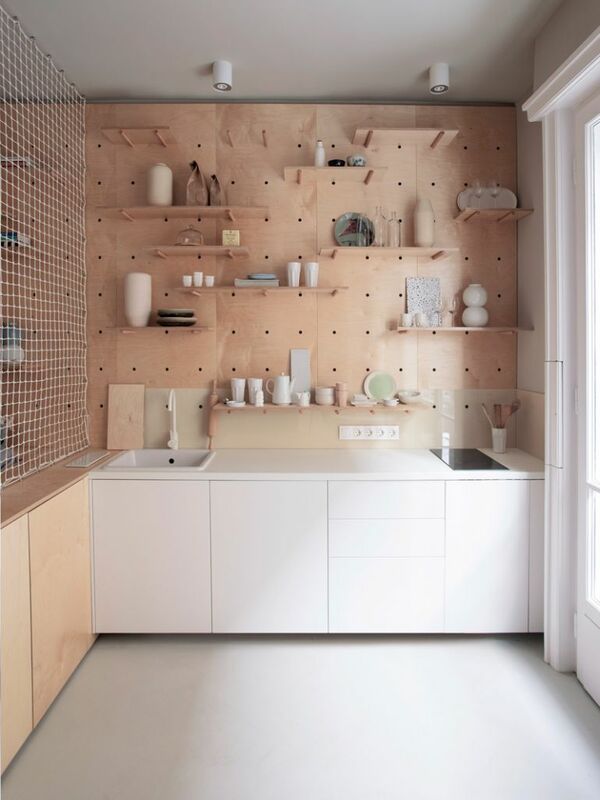 Simply put, the owner can mix and match his/her modular shelving units in accordance to the requirement. And at last but not the least, the opposite side of this ‘shelving facade’ offers even more storage with a hanger array for keeping your clothes.